DALLAS (September 20) – OP Live Dallas, a premier esports event, will welcome collegiate teams from across the nation to compete in an Overwatch tournament powered by the Dallas Fuel and Team Envy. OP Live is being presented through the collaboration of eGency Global, a leading esports production, marketing and talent management firm and SMU (Southern Methodist University) Guildhall, the top-ranked graduate school for video game design in the world. The tournament will consist of opening rounds, quarterfinals and semifinals, before culminating with a tournament final and awards ceremony. Invited colleges will also have the opportunity to interact with Dallas Fuel players and coaching staff. First Opening round begins at 10:45 a.m.
What happens when the hunter….becomes the HUNTED?!?! 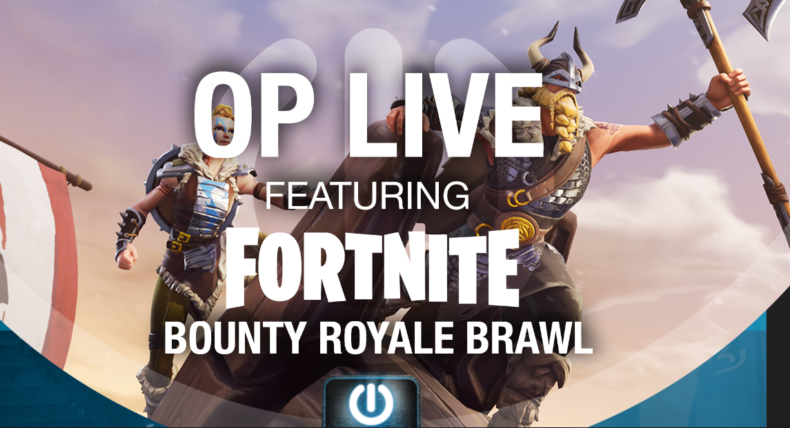 OP Live is excited to introduce the Bounty Royale Brawl featuring Fortnite! OP Live attendees will get the chance to face off against members from our invited pro teams, and aim for a spot in the final OVERPOWERED round by hunting and eliminating a pro (or getting a victory royale). Meanwhile, Pros, compete to eliminate as many other players as possible, until the final round where they have to hunt each other as well… in the world’s most popular game.How Does It Work? On Sunday the 23rd, two pro players face off against 98 attendee duo pairs. Each round new attendees face off against a new pair of pros. Attendees who win a match or eliminate an invited player are automatically placed in the last round along with all the invited players. Pros will be competing against each other and will earn points per elimination, or if they get a Victory Royale. In the final round eliminations against another pro & the Victory Royale will be worth more. The top 14 placed attendees will advance to the final game. The only exception to this rule is if a player who is not in the top 14 placed attendees kills a pro player. Attendees who kill a pro player automatically advance to the final game. In this case, we will take the top 13 placed attendees. Finally, all players are rewarded based on placement in the last round. The winner gets the title of OP Bounty Hunter, and the prize to go with it. Sign-ups will take place Saturday the 22nd and Sunday the 23rd at OP Live! Sixteen universities will compete in a collegiate Overwatch tournament powered by the Dallas Fuel and Team Envy. Invited Colleges will get a chance to prove themselves in front of head coach Aero and members of the Dallas Fuel. Watch as rivals arise, and competitors fall until one remains as the Over Powered Champ! Baylor UniversityCome out and meet members of the Dallas Fuel Team, and watch some of your favorite college rivals battle it out! The tournament will consist of two stages, a double-elimination group stage and a single elimination knockout stage. The top two teams from each four-team group will advance to the knockout stage. The group stage will follow GSL formatting to ensure a consistent number of games. In each group, there will be two matches to begin the stage. The winner of each of these matches will play against each other, and the winner of that match will advance as the first seed out of the group at a record of 2-0. The loser of this match plays the winner of the loser’s match to determine who will be the second seed at a record of 2-1. After the group stage, the remaining teams will compete in the knockout stage. Quarterfinals will be Bo3 between the first and second seed from different groups. The winner of each quarterfinal will advance to the semi-final which is also a best of three. The remaining two teams will compete in a single Bo5 in the finals. Maps and matchups for each round will be announced day of the event. Students participating in the tournament need to bring a valid ID and student ID for registration. – Saturday, September 22 from 1:00 pm – 6:00 pm. The games will be streamed on https://www.twitch.tv/op_live_dallas.